Compact coolers for cooling draught beer before its tapping. DBWC-C103 is the undercounter water cooler for cooling down 3 beer lines continuously with cooling capacity up to 100 liters of beer per hour. The DBWC-C103 undercounter water cooler stands out from conventional water coolers not only because of its design and processing quality, but because of the completely innovative arrangement of the cooling unit, high performance, light weight, small dimensions and simple design. DBWC-C204 is the undercounter water cooler for cooling down 4 beer lines continuously with cooling capacity up to 200 liters of beer per hour. 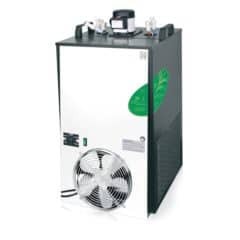 The cooler is environmental friendly – according to Green line specification. The DBWC-C204 undercounter water cooler stands out from conventional water coolers not only because of its design and processing quality, but because of the completely innovative arrangement of the cooling unit, high performance, light weight, small dimensions and simple design.esign. 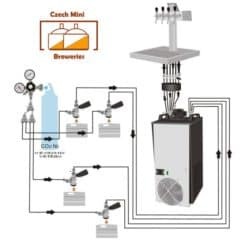 DBWC-C206 is the undercounter water cooler for cooling down 6 beer lines continuously with cooling capacity up to 200 liters of beer per hour. The cooler is environmental friendly – according to Green line specification. The DBWC-C206 undercounter water cooler stands out from conventional water coolers not only because of its design and processing quality, but because of the completely innovative arrangement of the cooling unit, high performance, light weight, small dimensions and simple design.esign. DBWC-C304 is the undercounter water cooler for cooling down 4 beer lines continuously with cooling capacity up to 300 liters of beer per hour. The cooler is environmental friendly – according to Green line specification. 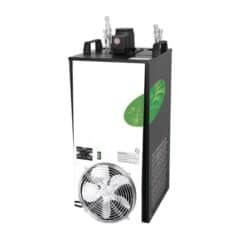 The DBWC-C304 undercounter water cooler stands out from conventional water coolers not only because of its design and processing quality, but because of the completely innovative arrangement of the cooling unit, high performance, light weight, small dimensions and simple design. DBWC-C306 is the undercounter water cooler for cooling down 6 beer lines continuously with cooling capacity up to 300 liters of beer per hour. The cooler is environmental friendly – according to Green line specification. 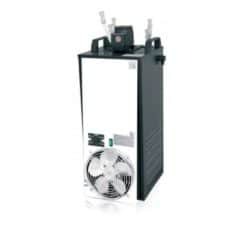 The DBWC-C306 undercounter water cooler stands out from conventional water coolers not only because of its design and processing quality, but because of the completely innovative arrangement of the cooling unit, high performance, light weight, small dimensions and simple design. DBWC-C308 is the undercounter water cooler for cooling down 8 beer lines continuously with cooling capacity up to 300 liters of beer per hour. The cooler is environmental friendly – according to Green line specification. The DBWC-C308 undercounter water cooler stands out from conventional water coolers not only because of its design and processing quality, but because of the completely innovative arrangement of the cooling unit, high performance, light weight, small dimensions and simple design.